I’m visiting a high school friend and her family and wanted to make her kids, Liam and Zoe, stamps (hanko) as a little gift. If we have time, maybe even paint! The first photo is the before picture — first I heavily penciled on paper their names in Japanese katakana (the phonetic alphabet used for foreign names and loan words); then I pressed a piece of eraser hard onto the penciled letters; finally, I traced again over the pencil marking on the eraser to make them more visible. What you see in the first photo is the result of this set pf steps. The second photo is the after — Liam on the left, and Zoe on the right. I took an exacto blade, the silver one in the first photo, and carefully carved out the letters. Then I reshaped the body of the stamp, giving Zoe’s stamp a heart shape and Liam’s a geometric shape, and I inked them to test. One of the things with these stamps is that their names both start with katakana characters that are hard for me to get. Liam starts with リ　and Zoe starts with ゾ, which can sort of look similar. My own name, in fact, was always a little tricky for me to get right when handwriting in Japanese、as it involves those same two characters, plus another tricky one, ン, which　sort of looks like the other two — Alison is アリソン . 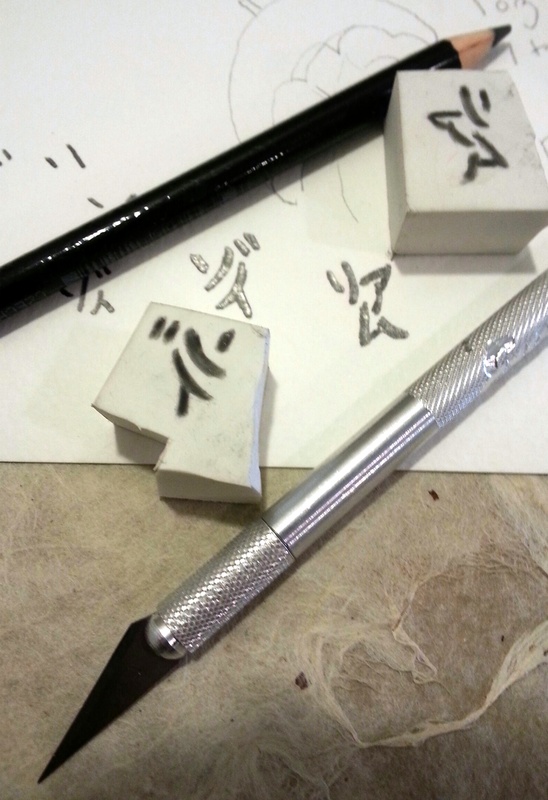 I think I got them okay on these stamps — although I’m not quite happy with the last character in Liam’s, the ム. 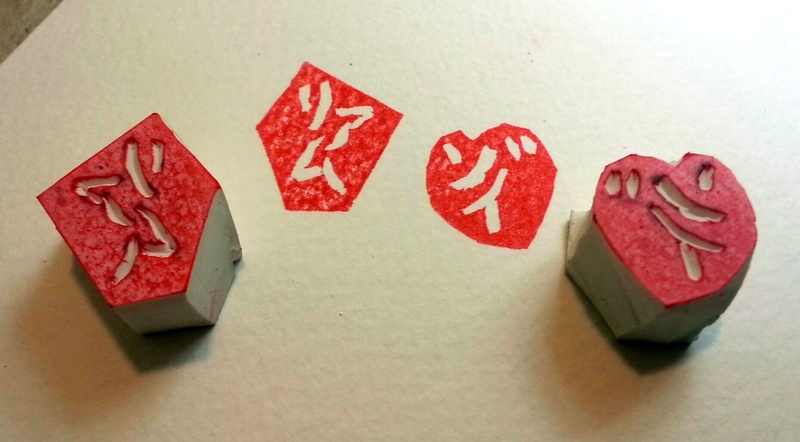 If you’re interested in making your own hanko, Dosankodebbie has some pretty handy instructions here.